Yes. It's finally here! Ready to ship! This listing is to Ready to Ship! This book is packed with over 20 detailed and hand drawn original illustrations by me, Kierston Ghaznavi! 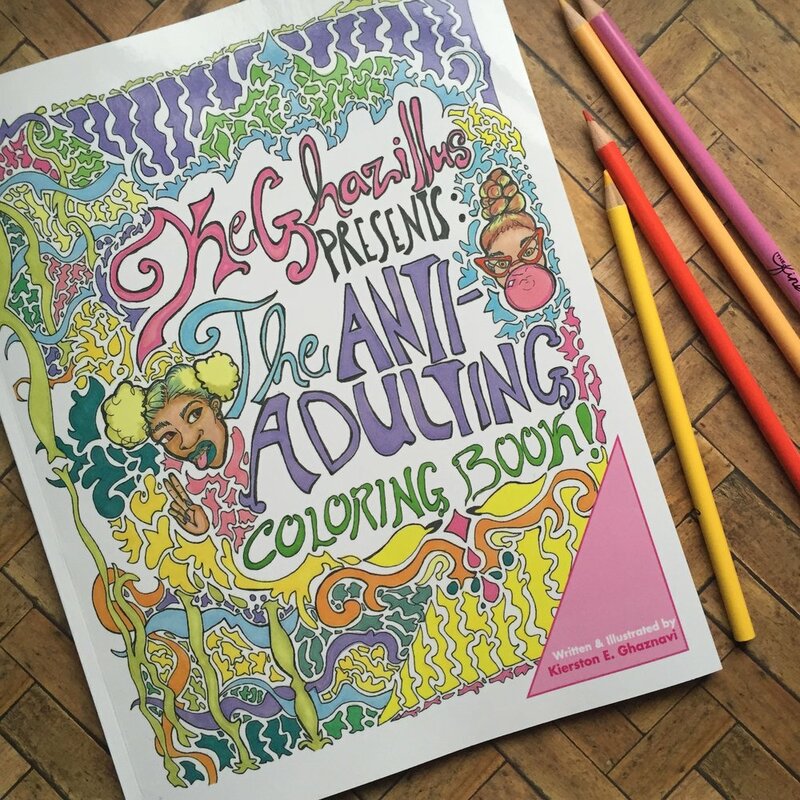 Enjoy hours of relaxation and coloring fun as you "anti-adult" your day away! Color in fun scenes like Party, Beach, BBQ, or detailed pattern pages like Ice cream, Lingerie, Bike ride, and more! You're free to use any coloring medium you're comfortable with: pens, crayons, colored pencils, markers, watercolors etc. I retain the rights to all artwork, cannot reproduce or redistribute without permission. This book was hand drawn by me. I designed the cover art, created the layout and used Lulu printing services to create the physical books. It's been a while since I've had a giveaway and I think it's long overdue! This past week I had a open poll, asking what would you choose to win as a free gift? 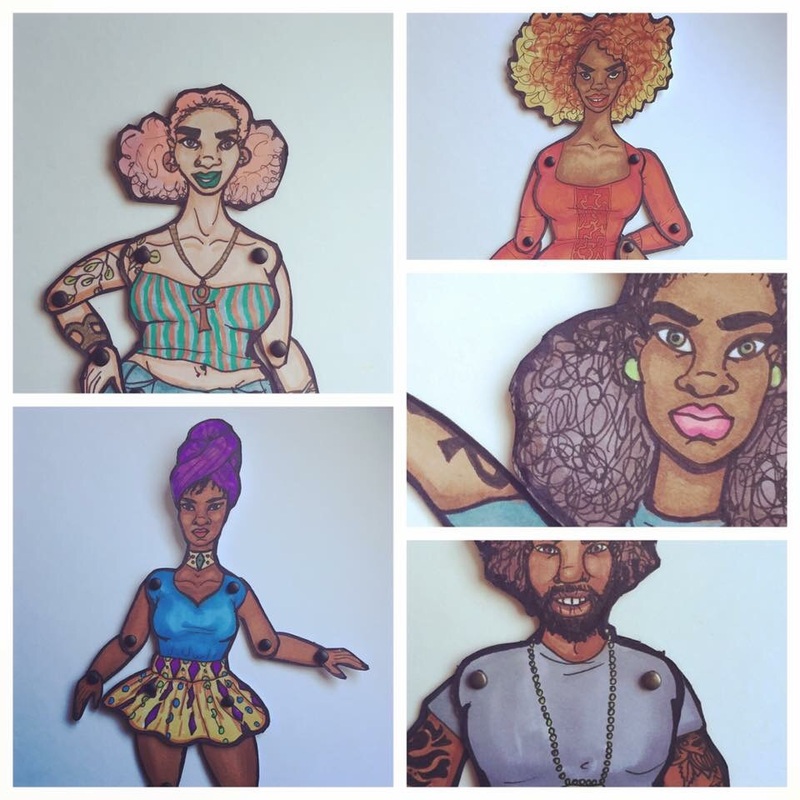 Mini custom paper doll or a pair of earrings or pin!! Ok so how do you win? 3. Share my page with your Facebook friends. Once I reach 750 likes on my Facebook page, the contest will be over, I will randomly select a winner! The winner will be announced on my Facebook page and then contacted by email to begin the custom doll process or to select a pin or a pair of earrings!! Head over to Facebook now & get started! I haven't made any updates to my website in a while, (since last December, yikes!) and my work has grown quite a lot this year. I added some more current Marker work, better images of my paper dolls and a few pages from my upcoming coloring book, The Anti-Adulting Coloring Book. I did some marker studies of Masked women, the bunny mask was quickly a favorite. What do you think of it? I updated the photos of my paper dolls and added more images. The coloring book is almost here! added a few images from it to my website, enjoy the sneak peek! Take some time & have a look at my updated site! Comment below and let me know what you like about it! I wasn't born here, but I've lived here in Milwaukee since before my 1st birthday. This is my home. The current climate of anger, unrest and frustration may not be understood by those who live outside of the city or were not raised under the same circumstances as the people they judge for rioting. I'm in my mid-thirties, I go to a full time job every day, for 40-50 hours a week in addition to creating art in my off time, I just go to work and back home. I live a few blocks away from the Sherman Park area where this began. I may not like the violence or the damage being done to the city, Who does? But I am not angry with these young people. I can hear and feel the pain in their voices when they speak. It's time to listen to them. It's not just because of their personal loss of a family member, its deeper than that. Milwaukee has failed our youth. violence has surged here in the past few years, many Milwaukee Public Schools have been closing, jobs are leaving the city. There is a long history of police brutality here. These riots aren't just about a young man being shot by a police officer, it's an explosion of bottled up anguish and loss of hope. I understand. I won't condemn them. Milwaukee is the most segregated city in the country and often lands on those "Worst Cities for Blacks to Live in America" lists. I just hope that, with the eyes of the world turned to our city, we will start to see those in positions of power begin the work needed to bring about change. Those that can’t do, listen. Is that the saying? I listen to music while I’m driving, drawing, showering, doing laundry, cleaning. Sometimes I find myself watching tv and wondering what that noise is in the background. Oh. My phone is still playing music… It really is the soundtrack to my life. I put together a Spotify Playlist of the songs that I'm currently obsessed with. I listen to a lot of different music while i'm drawing or painting or making earrings and dolls. The music inspires what i'm creating. It also keeps me going, I can create for hours with the right playlist or album playing. The music I'm obsessed with changes A LOT, as i discover new artists or even old ones I've never heard before. I can't wait to see the colored pages!! 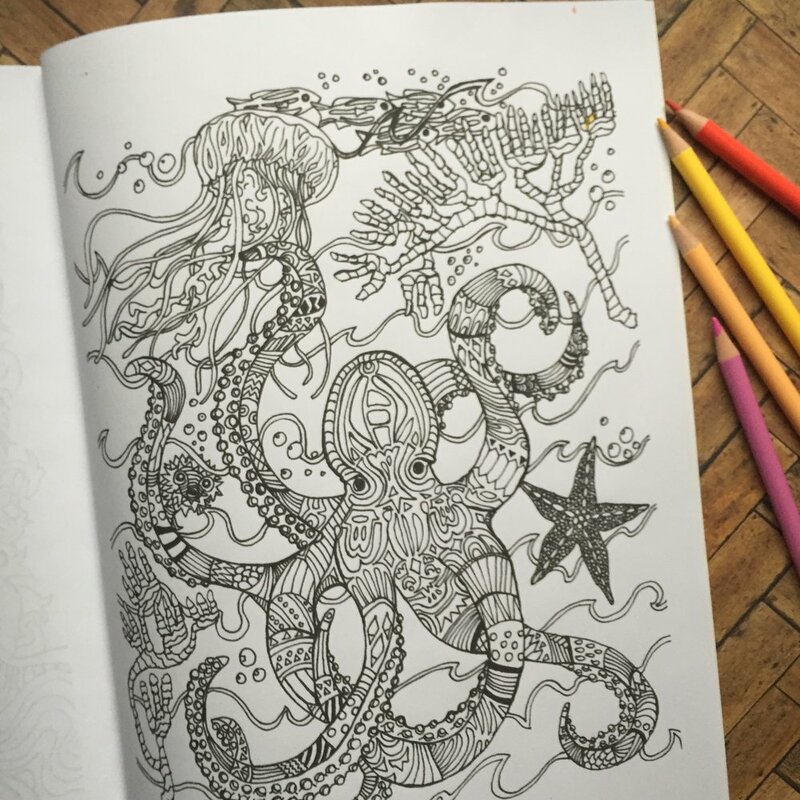 You can still get a free coloring page before the coloring book is published, just sign up for the Newsletter here and get a printable sheet! If you read this blog, you know that I am partnering with Pearls for Teen Girls in Milwaukee for my community art project in the From Here to Her 2016 show, Mothers of Our Nations. The team at PEARLS is dedicated to empowering young girls in all aspects of their life, and preparing them with the tools they’ll need to be successful in the future. It’s not just about preparing for college, but really building character and mentoring relationships that last beyond college. I will be creating work to honor the staff at PEARLS and I am also currently volunteering this summer to help the girls create paper dolls of their own. We are in the second half of the summer program, and this has been fun and challenging for myself and the girls. This has challenged me to think of the process in my doll making and try to express that in a manageable, step by step way, so that the girls can comfortably work at their own skill levels. There are some girls who dived right in, already love to draw and are moving along pretty quickly. And some girls aren’t too confident in their drawing skills. So I have been working a little more closely with them, trying to reassure them that they are better at drawing than they think they are. All of the dolls that the girls are working on are as unique as each girl and full of imagination. I hope that after this, the girls find a new hobby, maybe start drawing more often and are proud that they challenged themselves to do something outside of their comfort zone. PEARLS summer group. Girls busy drawing their dolls. Some dolls are already pretty close to done. My weekly newsletter, Curls & Markers will be debuting tomorrow. I plan to give weekly updates on my current in-progress work, discounts for merchandise in my etsy shop, as well as first dibs on new items, sales and offers! Don't miss out! BONUS: if you sign up for the newsletter before it debuts on August 2nd, you will receive a FREE instant downloadable coloring page, from my upcoming coloring book!!! 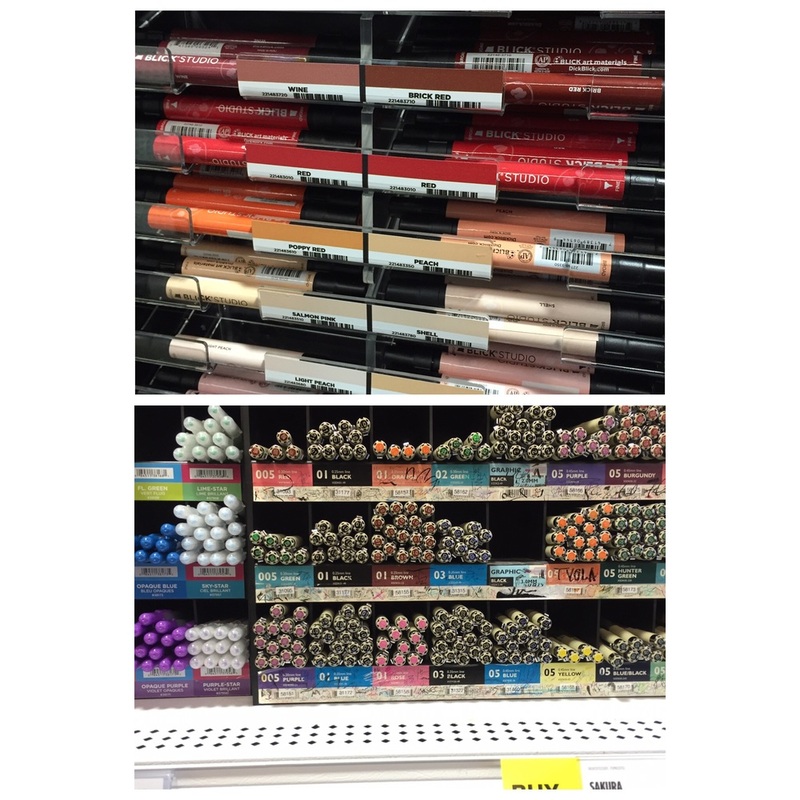 My Favorite Mediums: Let’s Talk About Markers. I have spent a lot of time drawing my characters in pen, scanning them and coloring them in Adobe Illustrator. 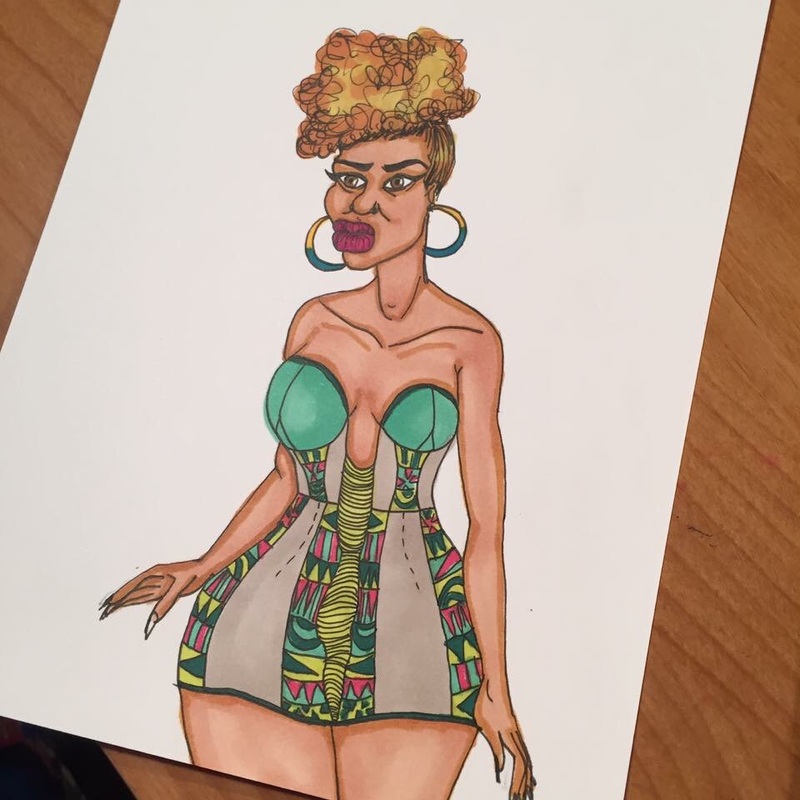 I started using markers this past winter to color my illustrations, and I fell in love. It took some time to get used to the technique. Learning how to blend and build up color, depth and texture; this took a lot of practice. Currently, I use Prismacolor markers, and I really like the quality of the Blick store brand markers. These markers have a fine tip and a broad tip which make it easy to fill in any odd shapes and curve that I may draw. I use markers for my illustrations. But also, I use them for my earrings and pins. 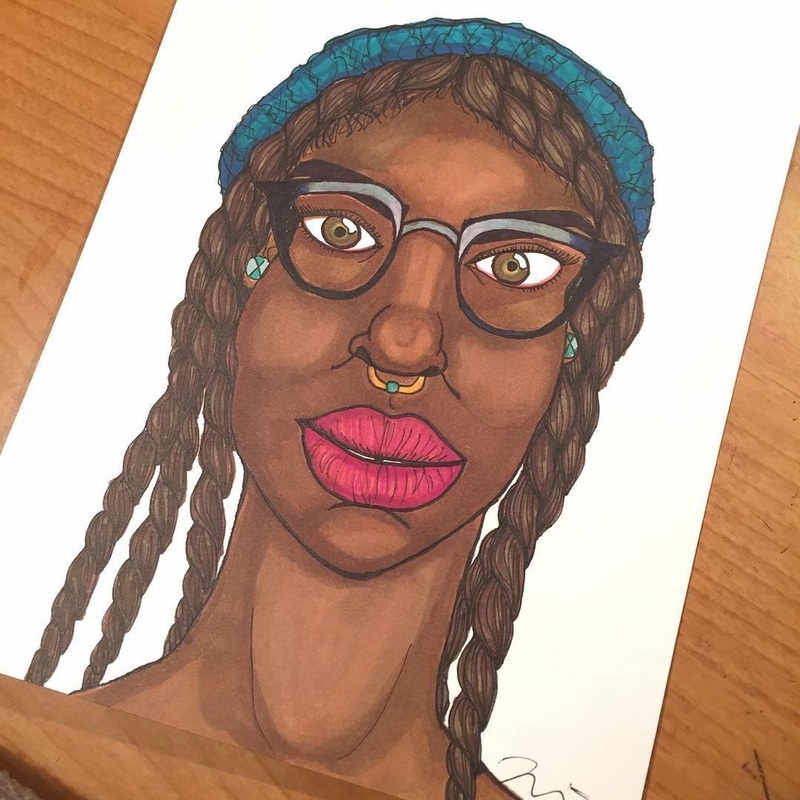 What I love the most about using markers: creating variations in skin tone and color. I'm pretty good at blending markers now. I can't wait to have a 300+ color collection of professional grade markers. This became a cute paper pin. I use markers when I make earrings. How do you feel about drawing with markers? Have you tried it? Share in the comments!! Sign up now for my newsletter, Curls & Markers! Coming in August. Be the first to receive news, discounts, and sneak peaks at work in progress! What can I say about myself, other than I'm just a pretty laid back Midwest girl. Somehow I found 30 facts I could share. Enjoy! 1. Let’s start from the beginning, I was born in West Helena, Arkansas. 2. I’ve lived in Milwaukee, WI since I was a baby. 3. Except for 6 months living in Dallas TX, when I was 8. 4. I am the Oldest child of 4 siblings. 5. I’ve never met my biological father. 6. I won a water pollution poster contest when I was in second grade. This is when I realized how important art is to me. 8. I was obsessed with Punky Brewster as a kid and dressed up like her for Halloween for year. 9. When I was in high school, my favorite after school sandwich was peanut butter, jelly, cheddar and sliced carrots. 10. I’ve never had a broken bone. 11. I did sprain my ankle & had to use crutches when I was 18 because of my platform sneakers. 12. I was in the 5th grade during the Jeffery Dahmer era-- before that happened, my elementary school used to take us to tour the Ambrosia Chocolate Factory, probably during Dahmer's employment there. 13. I was 28 when I took my first flight. 14. I didn’t get my driver’s license or drive until I was 31. 15. I once saw Eric Benet and Halle berry in the mall, WHILE listening to an Eric Benet cd in my Discman.. I’m so awkward, I just hurried in the opposite direction. 16. I don’t like to wear matching socks. 17. I have no tattoos. 18. I had my tongue pierced when I was 19, but took it out after a year. I still have a slit in my tongue. 19. If my daughter Amaya were still alive today, she would be 9 years old. 20. My daughter was an organ donor, and I spent some time speaking & spreading awareness about the need for organ donors after her death. 21. I drink hot tea & coffee all year long, rarely drink iced coffee. 22. I can quote the movie, My Girl almost verbatim. 23. For about a year, I was convinced that The Blair Witch Project was real. And my best friend and I are so stoked about the new sequel. 24. I had a childhood fear/fascination of tornados, and when we moved to Dallas, I was pretty paranoid. 25. In high school I used to come home to watch Jeopardy and play along. 26. I had a pet parrot in high school, named Parabola. 27. Some of the places I hope to visit in the future: Italy, Hawaii, Jamaica, Amsterdam, India, Toronto. 28. I have identical twin nephews, Identical twin cousins and fraternal twin aunts. 29. I'm right handed and three of my bestest friends are left handed. 30. I took Spanish classes from 6th to 12th grade & I barely remember a word. So, have you found out anything you didn't know about me? Tell me something about you and what you think of this list! Comment below! 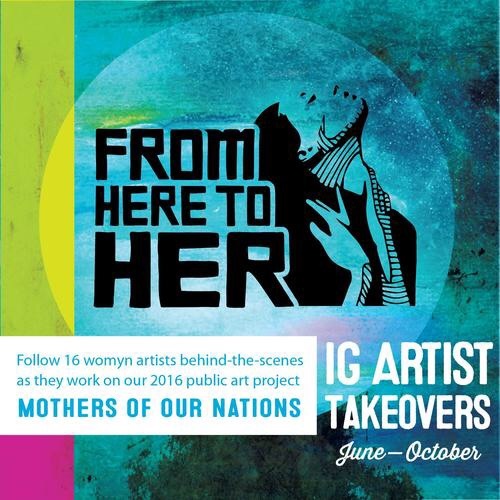 I am proud to announce my participation as a guest artist with FROM HERE TO HER ‘s 2016 public art project, MOTHERS OF OUR NATIONS. I’m volunteering with the group this summer, teaching the girls how to make self-portrait paper dolls. As well as creating dolls for the PFTG staff. I’ll be sharing the progress here on my blog and during my FROM HERE TO HER IG Takeover, July 24th-30th. Follow @fromheretoher on Instagram for updates from all of the artists. Selling on Etsy: Ready to Ship Items in my Etsy Shop! My etsy shop is a work in progress. Currently I have a few stud earrings and paper dolls in stock, as well as ways to take in any custom requests. I have a growing list of the kinds of merchandise I'd like to offer. I'm slowly working my way down that list! 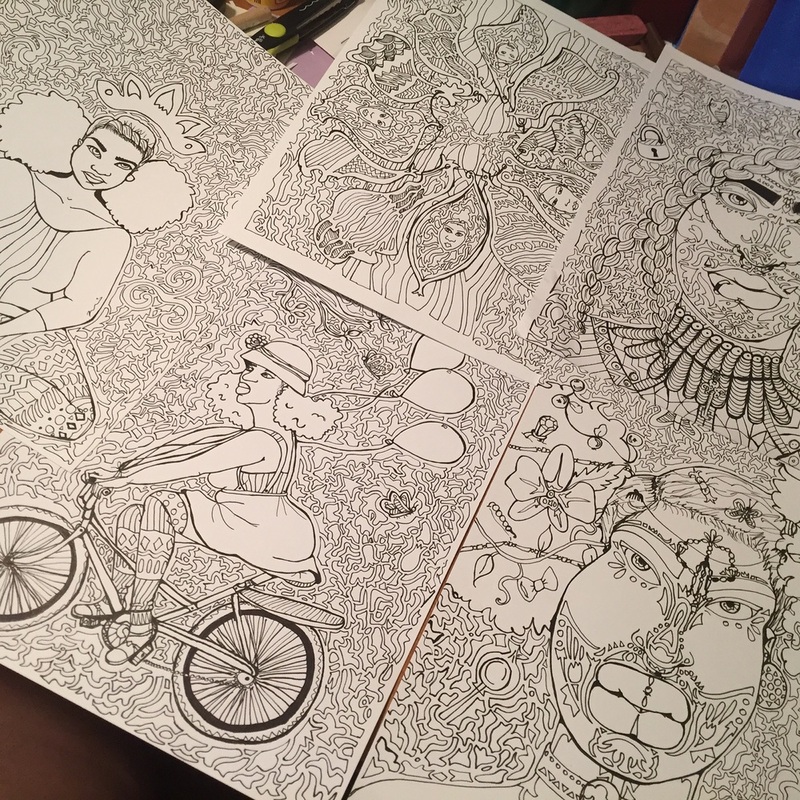 The adult coloring book is in progress right now. Pins, mini illustrations, cards and totes are just a few of those things coming soon. Take a look at some of my favorite items currently listed and ready to ship in my shop! This is probably my favorite of all the dolls I've made. Her cotton candy Afro puffs are the cutest. You can't help but love her and laid back personality. I think these are adorable. I've learned a lot from making earrings with shrink plastic. I really enjoyed the process. This doll was one of the first dolls I made. She was kinda the blueprint for the rest of the dolls moving forward. Earrings displayed in Kraft jewelry box. 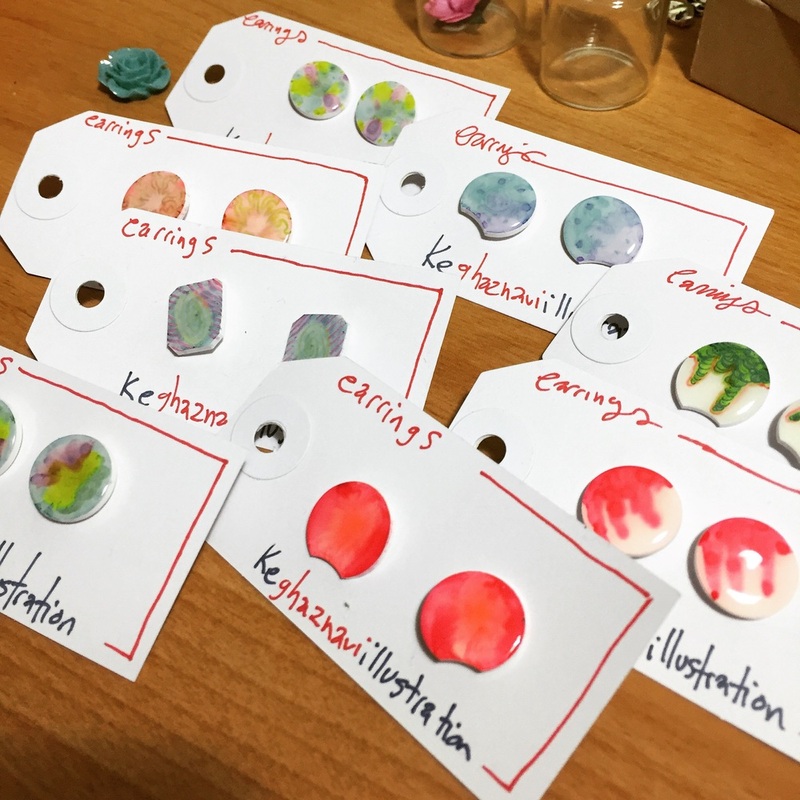 The marbled look on these earrings came from experimenting with different color combinations and sealing techniques on the surface. It's quite lovely. This is another one of the first dolls I made. It's hard to pic a favorite, I do love them all. I really have fun making these earrings, coming up with different graphics and textures. Hope you enjoyed that little tour! Keep an eye out for new items coming soon! I started using Etsy a few years ago to buy unique and super-cute handmade stuff. I love finding OOAK earrings and quirky vintage clothing. Etsy is the go-to place for that and much more. Last year, I decided that I wanted to sell some artwork online and so I opened my shop. I put up listings of original illustrations and crossed my fingers. I was sure they would sell because they were so cool. Nothing. My views were drier than an Arizona rattlesnake’s belly. I had a small following on Facebook & Instagram, but still, no shop action. But I really didn’t put any work into transferring my brand into the look & feel of my shop. Sure I had my logo and banner, which is unified across my social media platforms, but there was a lot that I had overlooked. I didn’t realize until I bought this book, Etsy Empire, earlier this year just how wrong I had gotten the Etsy selling experience. Boxes and label stickers for my earring shipments. Not treating my shop like a boutique. Etsy isn’t just a site to post ‘decent’ images in hopes of a huge payday. So you’re an artist, jewelry maker, crochet-er, or doll maker? Guess what? There are THOUSANDS of shops with thousands of similar products on Etsy. Pretty easy to get lost in the mix. In order to stand out, you need to think critically about every part of the buying experience, so that potential buyers will have a little bit of a push to buy from your shop instead of any of the other makers like you. That means, going a little bit further to please your customers. 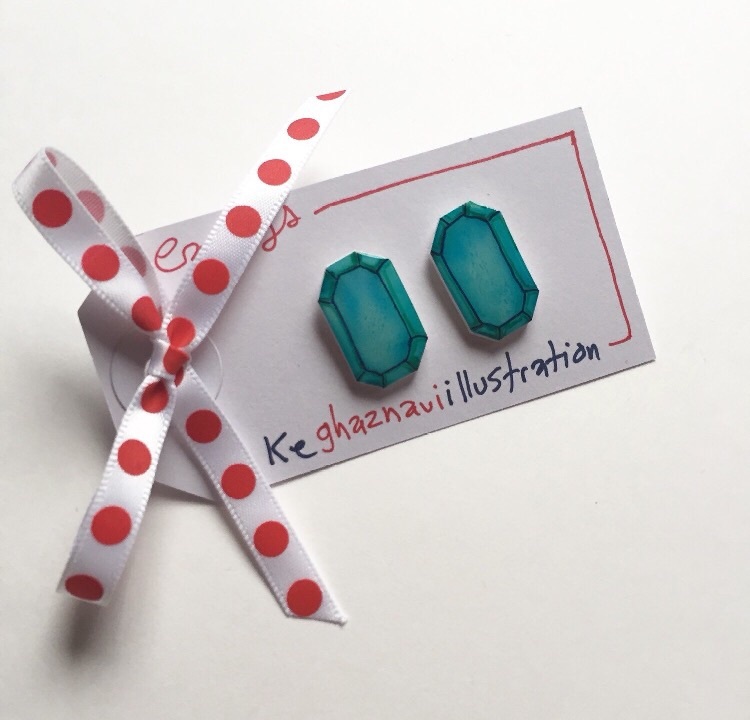 I sell my handmade earrings and paper dolls primarily on Etsy and with every purchase, I give the customer either a handmade paper pin or a small original illustration. Have you ever purchased something online and were surprised by a little something extra, doesn’t that feel so awesome? It’s part of what I love about shopping on Etsy because I can’t get an experience like that everywhere. I add extra stickers, and handwritten notes to each package I send as well. I add pretty washi tape and stickers to the outer packaging too! I want my customers to remember their experience and LOVE it enough to come back! Customer who loves her free gift included with her purchase. Customer photo with a free mini watercolor painting gift that I included in her package. The first time I added listings on Etsy last year, I only added one photo of each of my illustrations. It was just a close up of the illustration, just how it appeared on Instagram or on Facebook. Blah. Now, when I take photos of my earrings, I try to add some trinkets as props, and I take advantage of the option for 5 images per listing, I have photos on white, clean backgrounds, also on pretty paper. 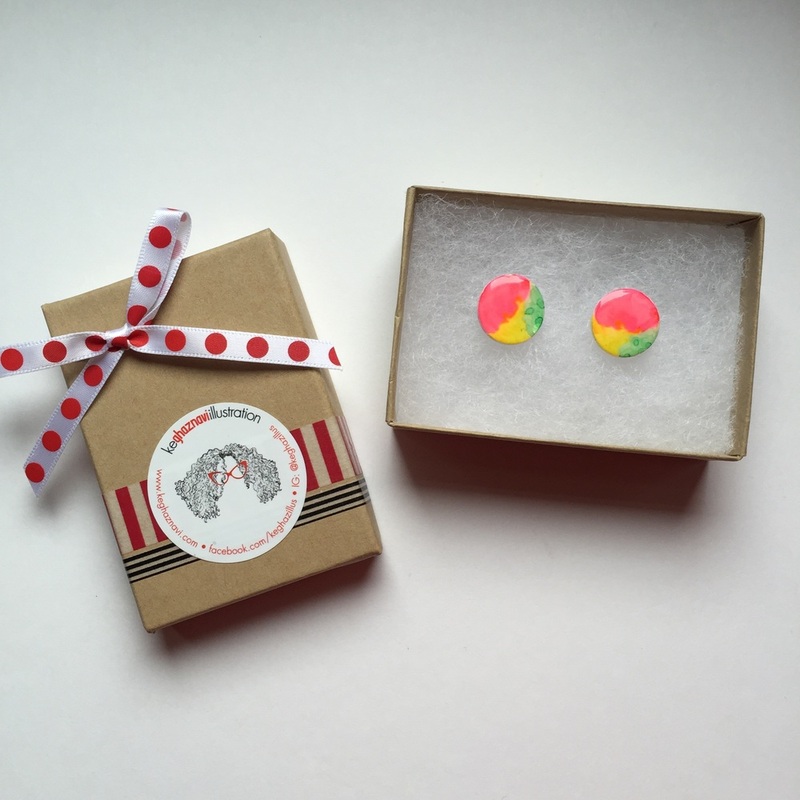 I also have photos of how the earrings look posed in the Kraft boxes. Buyers like to see the product “in action” if you are selling prints of your artwork, frame it and pose it on a nice table or on the wall. If you are selling clothing, get a friend to model, go outside and have some fun! Natural light is best, and you don’t need a fancy camera. I use my iPhone and Adobe Photoshop to get my pics as nice as I can. Little pins on prop paper with trinket props. Ice cream pin, with my jacket as a prop. Photos tell only part of the story, but descriptions, really spell it out for your customers, (ha! see what it did there)? Take time to think about everything you need to inform your customer about regarding your product. Color, available variations, size, care instructions to name a few. Tell a story! Make it funny, but be clear. Don’t mislead your customers. if you’re selling vintage items make sure you disclose any imperfections. Let them know the colors may vary because of screen resolution, things like that. A strong description with keywords will also help with SEO, allowing your shop and listings to show up in more searches and build relevancy. 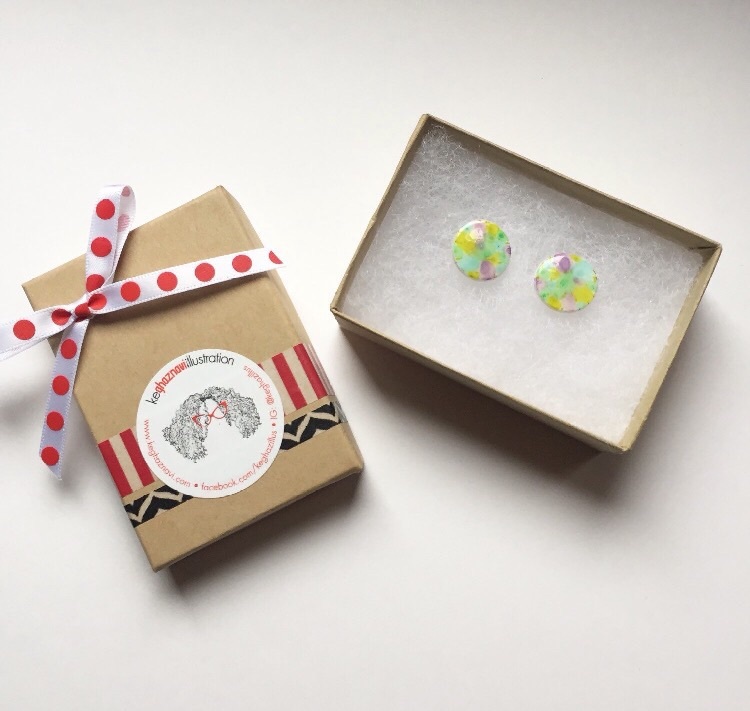 These shrink plastic button stud earrings make a unique gift for your sister, best friend, niece, mother, yourself, etc.! Everyone’s favorite day of the week! celebrate it in style, while you chomp on tacos & sip margaritas! Each design is hand drawn on shrink plastic, sealed with a clear coating and affixed to nickel-free earring posts"
Would you feel comfortable buying something from a shop with no policies listed plainly? You never know, unforeseen circumstances may arise and there may be an issue with a purchase. You may need to return or exchange an item, only to find out after your purchase that’s not allowed. Knowing that information beforehand may be the deciding factor on whether or not you’d want to shop there, right? Many custom and made to order items on Etsy are not refundable, and understandably so. But what happens if an item arrives damaged? Or your customer ordered a non-custom item that they aren’t happy with? How would you handle that? Make sure your policies are clear on what you can and cannot do in these situations. Even if you never experience an unhappy customer, its best to be prepared. How you handle these not so perfect situations will say a lot about your shop’s professionalism and help to hopefully build its reputation. Optimizing tagging and titles for search. No one can buy your items if they can’t FIND them! When I first started my shop, I gave my listings titles like “Girl dreams about life”, “handsome man and his thoughts”, “elegance”, “joy”. No one is searching for that! As artists, we love to give our work titles that are more about how the work makes us feel. Titles and tags for searching on Etsy should be more specific, but still short, 2-3 word phrases work best. Make sure your tags match the phrases in your titles! I hope these tips are helpful! These are things I learned that changed my shop in a huge way! Success isn’t overnight. I’m still tweaking my listings, photos and descriptions constantly as I continue to learn new tips and tricks. Find a team on Etsy or a group on Facebook with other shop owners willing to share what they’ve learned and how it’s helped them! My Favorite Mediums: Let's talk about Pen. I switched to drawing with pens in my sketchbook instead of pencils a long time ago, probably high school. The pencil sketches would smudge and I hated that I couldn’t get the lines to stay crisp. Back then, I was trying to draw more realistically, and I’m not good at that, I knew that early on. I was more interested in the story and the characters in my artwork than perfecting the form. Plus, I really have the WORST handwriting/penmanship, so in school I needed a nice fine tip pen to even attempt to write anything legibly, well that’s if I wanted to actually take notes to study with. And since most of my notetaking in school primarily consisted of doodles and daydreams, drawing with pens became my favorite way to draw. Neatness was definitely not a priority when I drew, and it still isn’t when I’m freehand sketching. I loved the texture of the pen scrawling & scribbles, and building up the dimensions with varying my pen pressure on the paper. Nowadays I work primarily in pen, but I try to be a little more clean with my strokes and more decisive with my pen marks. I use pencil lightly to sketch my ideas, placement, expressions etc. then I add in the permanent lines. From here, I color in with my markers or I scan the image & add color in Adobe Illustrator. When I draw in a freehand manner with my pen, its generally in these curvy and semi connected shapes. I can do this for hours, throw on some music, or a podcast (We Hate Movies, The Read, MmHmm Girl, 2 Dope Queens, This American Life—my go-to broadcasts) or I pull up Seinfeld reruns on Hulu and zone out. I draw them as just outlines, sometimes as part of a zentangle or I spend time coloring them in with fine point sharpies. When I create, I use pen primarily and it's the medium I am most comfortable with. What do you think about drawing with pen? Would you try it? Share your thoughts in the comments! 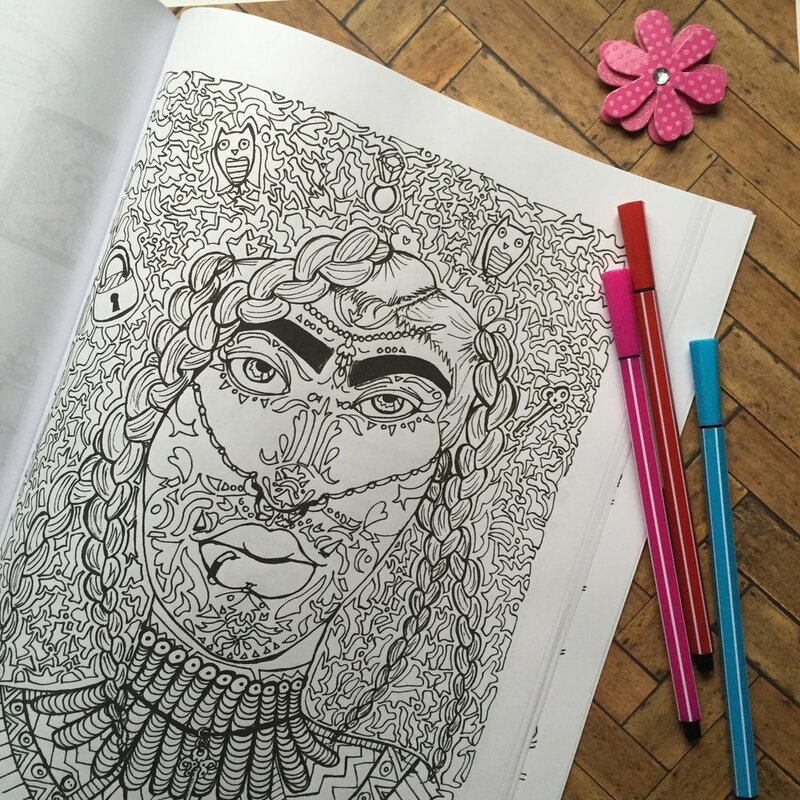 Coming Soon: a very KG Adult Coloring Book! I'm plowing through a lot of Micron pens these days, as I crank out illustrations for the coloring book. I hope to have at least 20 pages of detailed scenes to provide hours of coloring enjoyment. 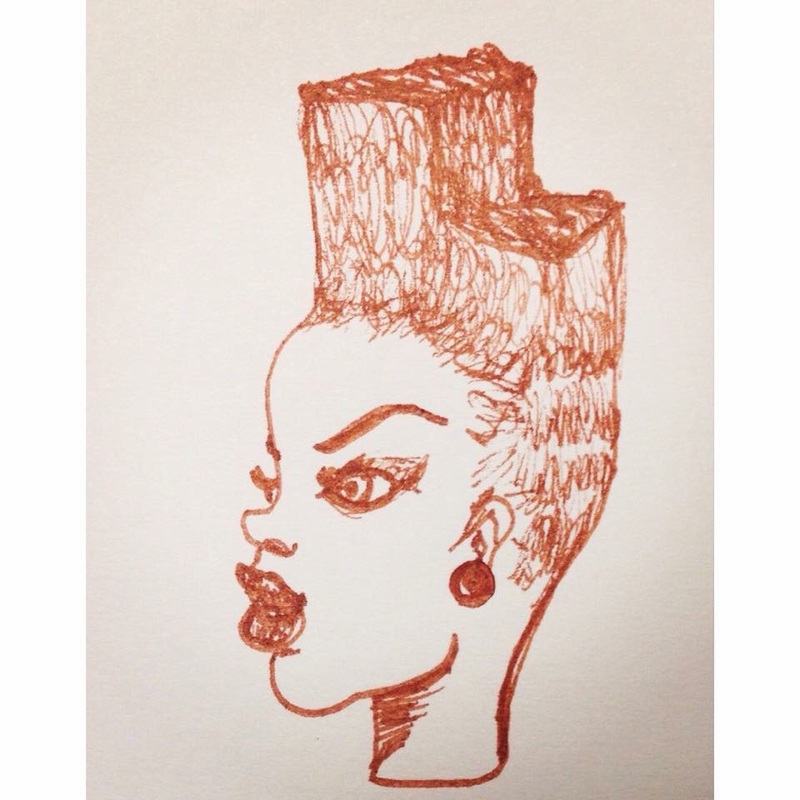 Get your markers, colored pencils and/or crayons in formation! The other half of the book will be everyday scenes, bike riding, chilling on the couch, house party, picnic and more. You can also head over to my etsy shop, Keghazillus, fav it & take a look at the other stuff I make, paper dolls, earrings pins. I hope to have a lot more coming your way! 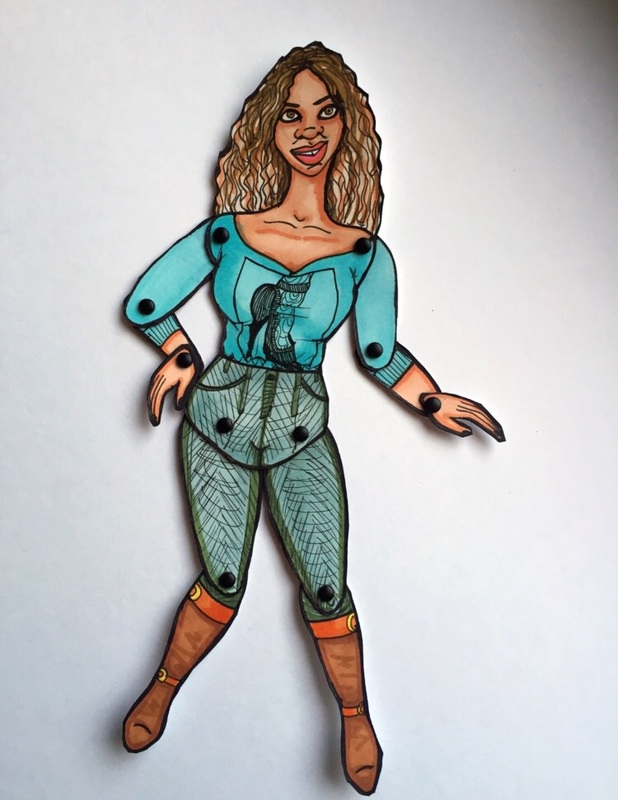 So you make Paper Dolls? I was an imaginative kid. I played with dolls, of course, as a little girl growing up in the 80s. I loved my Cabbage Patch Kids and my Strawberry Shortcake. But honestly, I could have a thoroughly good time playing with anything. I would gather up flowers & give them each a name and sit in the grass for hours playing 'house'. As I got older, I spent more time drawing to illustrate these imaginary stories I thought up. Then came the paper doll making. I loved fashion, but I was always an overweight kid/teen & back then there was nothing fashionable about those clothes. So I drew what I wished I could wear and I made beautiful modelesque paper dolls out of what I had available. Ruled notebooks. I would cut out my dolls from the sturdy backs of the notebooks and draw clothing on the rules pages I'd pose them and draw friends, boyfriends, settings. My homework and notes might have ended up on crumpled paper, but hey! As i got older, I still kept my love for play and dolls, but more as a play-time assistant to my younger siblings, nieces and nephews. I never stopped drawing though, but I did stop making dolls. So, last year- I went back. My illustrated characters have so much personality and individuality on the page. Making paper doll versions of these characters was a way for me to bring them to life, and revisit that time in my life when I was an imaginative kid, full of ideas and fully devoted to play. My dolls are not tall, thin model types, exclusively. My dolls represent and accept all body types. My dolls represent characters who are happy, beautiful, confident and unapologetic about it! My dolls give representation to girls and women who may have been told they are not worthy because of their uniqueness. My dolls are beautiful BECAUSE of their uniqueness. So yeah, I make paper dolls. Subscribe to my Newsletter, Curls & Markers! What words come to mind when you see this? I think of #water #nourish #nurture #love What about you? #Repost @5ptsartgallery with @get_repost ・・・ NEW WORK! 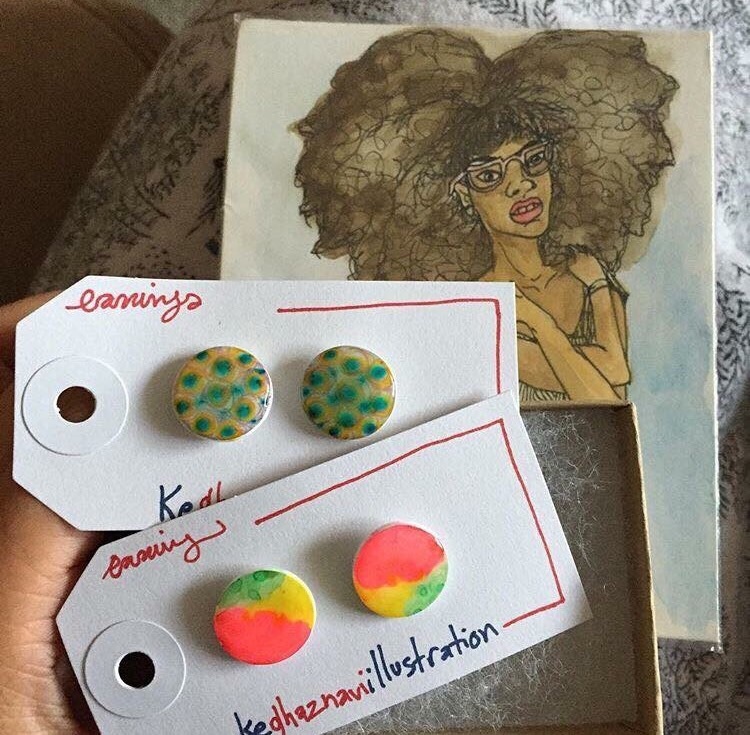 Original drawings, pins, and “All Bellies Are Good Bellies” tees by Kierston Ghaznavi @keghazillus 5 Points Art Gallery & Studios (3514 N. Port Washington Ave., Milwaukee, WI 53212) Extended "Holiday Art Sale". Come peruse the gift shop for these works + other small original art, cards, bookmarks, paper dolls, brooches and jewelry, designer bow ties and pocket squares, leather goods, home goods and more to satisfy your holiday gift list. Hours are Thursdays, Fridays, Saturdays 10am-6pm; Sundays 12-4pm. “REVIVE” exhibition still up with works available for purchase. #support #artists #buy #art #holiday #sale #give #gifts #2018 #holiday #christmas #stockingstuffers #wereallready #somethingforeveryone #goodmusic #goodvibes #revive #artexhibition #exhibition @ruthnathans @rosyricks @fkldesigns @5ptsartgallery @allisonwestbrookiv @dellaartwells2 @ammarnsoroma @nsoromaammar @davidnajibkasir @ckossers @valariatatera @arianavaeth @laniasprolesartist @keghazillus @shepatsdesigns + Chrystal Gillion, Rhonda Gaitlin-Hayes, Sonji Hunt, Mutope J. Johnson, Bennie C. Higgins, Mark Cergol, and Evelyn Patricia Terry. #Repost @fkldesigns with @get_repost ・・・ TODAY for Sunday Fun Day, 5 Points Art Gallery & Studios (3514 N. Port Washington Ave., Milwaukee, WI 53212) will be hosting the final day of the 3-day "Holiday Art Sale". Come peruse the gift shop for small original art, cards, bookmarks, paper dolls, brooches and jewelry, designer bow ties and pocket squares, leather goods, home goods and more to satisfy your holiday gift list. Event hours are 11am-7pm Friday and Saturday, November 23- 24, 2018, and 12-4pm on Sunday, November 25, 2018. “REVIVE” exhibition still up with works available for purchase. #sunday #sundayfunday #support #artists #buy #art #holiday #sale #give #gifts #2018 #3daysale #wereallready #somethingforeveryone #revive #artexhibition #exhibition @ruthnathans @rosyricks @fkldesigns @5ptsartgallery @allisonwestbrookiv @dellaartwells2 @ammarnsoroma @nsoromaammar @davidnajibkasir @valariatatera @arianavaeth @laniasprolesartist @keghazillus @shepatsdesigns + Rhonda Gaitlin-Hayes, Sonji Hunt, Mutope J. Johnson, Bennie C. Higgins, Mark Cergol, and Evelyn Patricia Terry.